Rescanning the VMFS volumes didn't help, removing and re-adding the VMware iSCSI Initiator entries didn't help.. what worked is rebooting the Iomega IX4-200d device. This was tested three times for verification.. if anyone cares to browse the vmware logs let me know..
Ended up getting close to a 40MB/s write and >70MB/s read rates overall.. 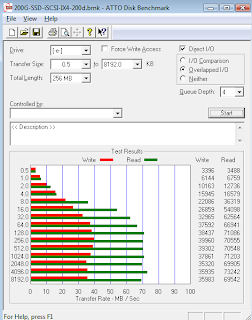 Thanks for checking the ix4-200d with SSD's Randy, pretty interesting that your figures don't vary too much from the straight SATA disk performance. It does suggest that the ix4-200d is the bottleneck, either the iSCSI, the CPU, or RAID5 performance has got something holding back the disks from performing with random workloads. Though as storagebod on twitter commented, everything low-end dies on random workloads, and the ix4-200d is incredibly cheap for what it does..
Is that we can directly replace 4 HD to SSD? Need hack or crack the rom?